A notice of strike has been filed again by workers of a garments factory in the Cavite ecozone in response to the mass termination of 16 union officers. The strike notice was filed yesterday by the union at the Dong Seung Inc., a Korean-owned apparel manufacturer inside the Cavite Economic Zone, the country’s biggest government-run export processing estate. “The firing of all 16 union officers, including the union president, is just the latest in a series of union busting moves by management. Moreover it is a maneuver done in bad faith as the union just withdrew a notice of strike earlier filed. 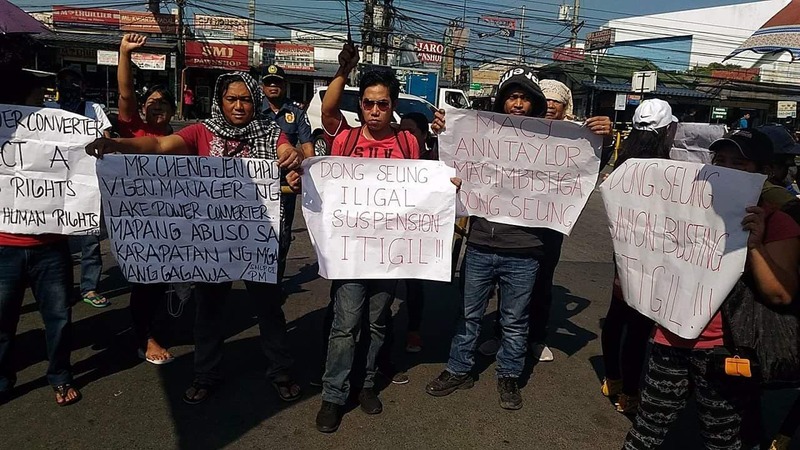 The retraction of the strike was part of an agreement mediated by the Labor Department wherein workers will be accepted back to work after an investigation by management,” explained Dennis Sequena, coordinator of Partido Manggagawa (PM), which is assisting the Dong Seung workers. PM announced that a big rally of some 1,000 workers is to be held on April 28 at the Cavite ecozone to protest the union busting at Dong Seung and other factories. The Dong Seung union officers were served notices of termination in their houses by an HR officer of the company last Thursday. They were supposed to back to work yesterday as part of the agreement. The original strike notice was caused by the one-month suspension of the 16 union officers. Dong Seung produces garments for global brands Macy’s and Ann Taylor. The company is owned by the Korean multinational Suy Co. which also owns LS Phils. and Lee & Choi in the Cavite ecozone and other factories in Indonesia, Vietnam and Guatemala.